World Famous Disc Jockey - DJ FINAL presents the Shaku Shaku Nigeria Mixtape... With no doubt, the dance is the current trend in the country and it is clear the direction that Nigerian artistes are starting 2018 with. 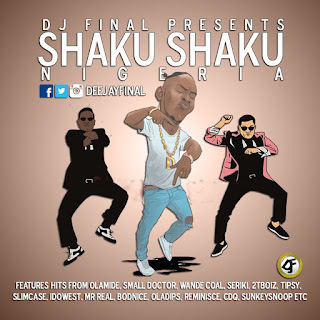 Here is a compilation of Hot "Shaku Shaku" themed songs as performed by various Nigerian artistes. Soon, maybe, the international community too could take the shaku shaku dance as another adoption from Africa. Like the pon pon sound was dominant on the continent in 2017, shaku shaku is already looking like it would play a major role in the party life and pop culture of Nigerians in 2018. You'll definitely keep pressing play.